The sparkling gleam of the multi-faceted faux crystal buttons that regally stud the tufted headboard of our Barbara Modern Platform Bed thoroughly befits a stylish, trendy bedroom. Made with soft white faux leather overlapping a foam-padded frame, this regal creation sleeps like a dream. The queen-sized platform bed, which requires only a mattress, comes with wooden slats that serve the same function as a box spring would. Silver metal legs finish off this spectacular piece of modern bedroom furniture. I purchased the bed for my son. He is very happy with it! It is a modern platform but the tufted headboard with the crystal embellishments give it a classic look. The bed was easy to assemble and is sturdy. I would definitely recommend this product. 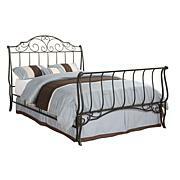 This bed looks great and was well worth the price. Looks difficult to assemble but really goes quickly with a power drill. Looks like a much higher priced bed. This pattform bed is so cute, I purchased it for my teenage daughter last month and she loves it.